T C Motorhomes is a Family run 5 Star Motorhome dealership, that has been trading for over 25 Years and is based in Herne Bay. The Company is a National Caravan Council Approved dealership and workshop facility, selling and maintaining quality new and used motorhomes. As a result of our success, we are looking to expand our workshop team and add an experienced motorhome technician to join our busy workshop and preparation team in order to meet the rising demand of our large customer database. Duties include Servicing, Habitation Checks, gas and electrical work, general fault finding and repairs. Motorhome product training Alde, Dometic, Truma, Thetford, Whale. Experienced technicians without the relevant qualifications will be considered as training can be provided in certain area's. The successful candidate must have attention to detail, will have a tidy, organised mentality and be physically fit, reliable, hardworking, have a positive attitude and be able to work as part of our friendly team. In addition, they must also have the ability to use their own initiative. This is a full time, permanent position, with a 5 day week Monday to Friday and every other Saturday morning. We will offer an extremely competitive salary for the right candidate and in addition to the basic salary overtime is available. or call the office: 01227 289111 and speak to Neil. "It'll take more than the recent bad weather to stop us collecting our brand new BESSACARR!" Grahame & Tina are pictured in the thawing snow, taking delivery of their brand new Swift Bessacarr 560 Lounge model from Shane Catterick here at T C Motorhomes in Hillborough, Herne Bay. 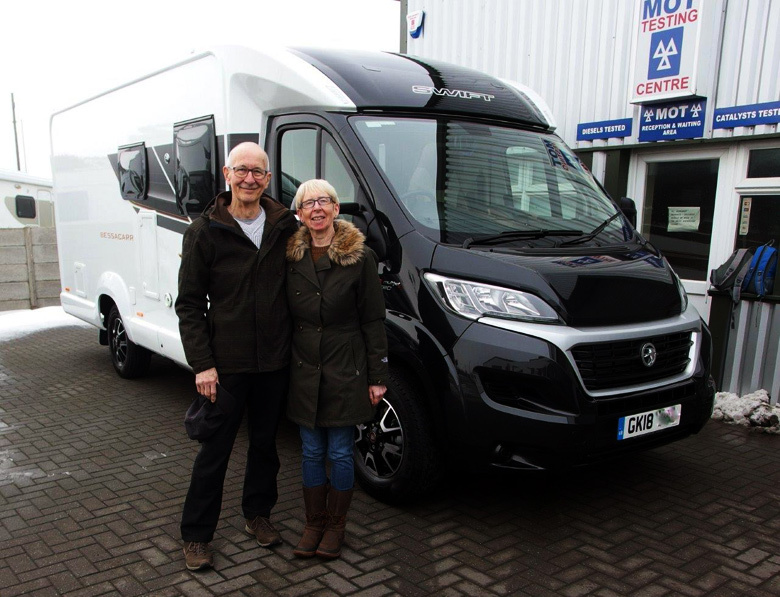 They bought a new Bailey from T C Motorhomes almost three years ago and recently decided it was time for a change. The Bessacarr 560 Lounge is very well appointed and provides a `Fixed Bed` layout which Grahame & Tina feel might be preferable this time around. Having run a Full-Marathons before, Grahame & Tina are both keen distance and cross-country runners and often find they can take their motorhome to where they might be competing. Grahame confirmed that they both enjoyed their running immensely, and with that said, it was very pleasant to take some `creature comforts` away with you when you’re away from home. The Bessacarr is well equipped in the creature comforts stakes, with sumptuous upholstery, Duvalay mattress, Alde Heating & Hot Water System, Solar Panel, TV Aerial and lots lots more ..
Shane Catterick and his colleagues at T C Motorhomes wish Grahame & Tina many miles of Cross-Country & Distance Running, and also some fabulous motorhoming experiences. For more information contact Shane Catterick at T C Motorhomes 01227 289111 or visit the Bessacarr section of our website. Below is a copy of an email we recently received from a couple who purchased a motorhome from us 4 years ago. They have been really happy with the motorhome and since purchasing it they have travelled a lot. Hello Shane & Everyone At T C Motorhomes Ltd. 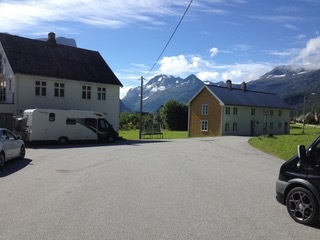 Here are 3 photos showing our Bailey Motor Home Autograph Approach 745 in Norway during our 2016 tour. 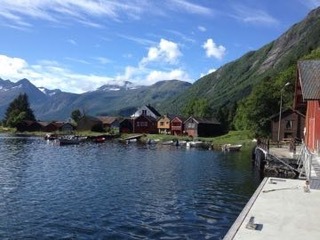 We stayed here for 3 nights, hooked up to a friendly Norwegian’ electric supply, through a mutual friend . 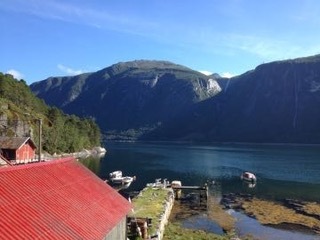 The other 2 photos show the spectacular fjord nearby. On this trip we visited France, Belgium, Holland, Germany, Denmark and taking the 4 hour ferry crossing from northern Denmark, Hirtshals to Norway. We purchased MH on 1st March 2014 from you at TC Motor Homes. We have toured extensively over the last 4 years in Europe and the UK. To date we have travelled 18.000 miles and generally average 5, 000 miles a year. We are delighted with our Bailey MH you sold to us and very pleased with the continuing after sales service we receive. Ian & Barbara, Ashford, Kent.